Enjoy a warm welcome at this comfortable hotel in the bustling heart of Chicago. Located just two blocks from Michigan Avenue and the Magnificent Mile, the hotel puts you within easy reach of some of the city’s finest shopping, dining and entertainment options. The hotel features contemporary styling and comfortable accommodations with modern amenities. Stay on track with your workout routine, with a seasonal rooftop pool and a fitness center. 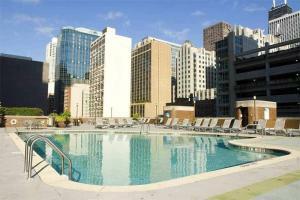 Located in downtown Chicago, approximately 45 minutes from Chicago O’Hare Airport. A short stroll to Navy Pier and Michigan Avenue.